The Full Body Sling is an easy sling to use while transferring the resident from bed to wheelchair, toilet or shower-chair or from the floor to a bed. It offers total head and neck support and the padded lower section provides additional under-thigh comfort and support. 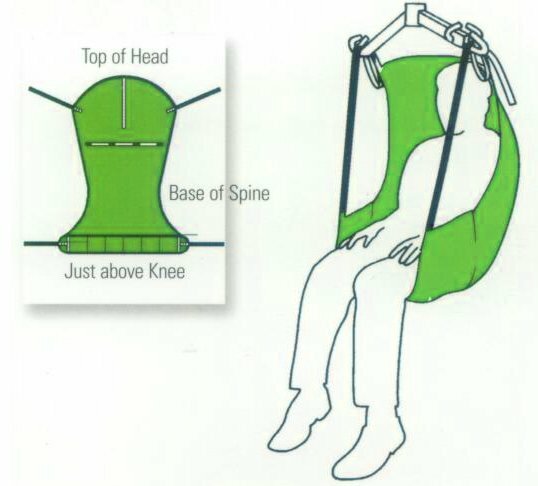 Use the full body sling for residents who are totally dependent, partially-dependent, non-weight bearing, very heavy or have limited head control. Use this sling for amputee residents (in a reclinded position). Choose from solid polyester fabric or bathing mesh, with or without commode opening. The mesh sling may be used for bathing or when the sling will be left under the resident. The solid polyeser sling should not be left under the resident for extended periods because the padding retains body heat. Residents may be seated on “pressure-reduction” cushions. 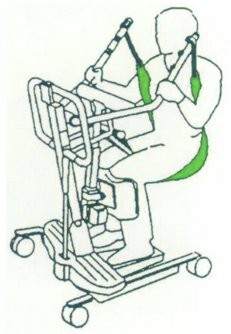 Standing slings are for residents who are partially dependent, have at least 60% weight bearing capacity, have head and neck control, are cooperative, can sit up on the edge of the bed (with or without assistance) and are able to bend at the hip, knees and ankles. 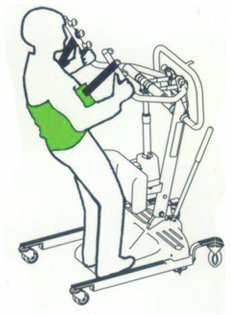 Transport slings are for transfering residents with minimal weight-bearing capacity, who have head and neck control, are cooperative, can sit up on the edge of the bed (with or wihout assistance) and are able to bend at the hips, knees and ankles. The U Sling offers superb acces for quick toileting and hygiene. It is easy to place and remove in a bed or chair situation. The fully padded design supports the back, offers under thigh comfort and allows for removal of clothing.